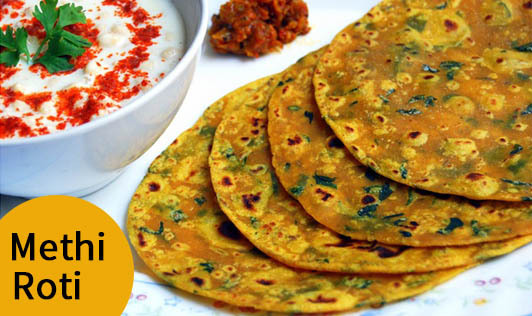 Methi roti is an easy to make recipe and is a good source of minerals. Methi is known for its iron and calcium content. Most of us ignore the importance of adding greens in our diet, as we either take them for granted or have too many other interesting foods to eat. Here is a simple way to include them in your daily diet, so you can reap its benefits. 1. Heat oil in a kadai. Add chopped onions and chilies, stir and sauté well. 2. Add palak and fenugreek leaves. 3. Add remaining ingredients except wheat flour. Sauté for few minutes till done. 4. Remove from the stove and add wheat flour and make the dough. 5. Make phulkas from the dough. Serve hot with curd or chutney. Dhal chutney or mint chutney could be a healthier choice for this recipe.